The director of the Hendricks Chapel Choir has been recognized for his participation in local community choral programs. Peppie Calvar, assistant professor and assistant director of choral activities in the College of Visual and Performing Arts’ Setnor School of Music, received the 2016 Paul and Veronica Abel Award from Civic Morning Musicals (CMM). CMM is a Syracuse organization that has presented concerts and championed music education for 125 years. The award recognized Calvar’s outstanding contribution to the art of choral performance for the community. 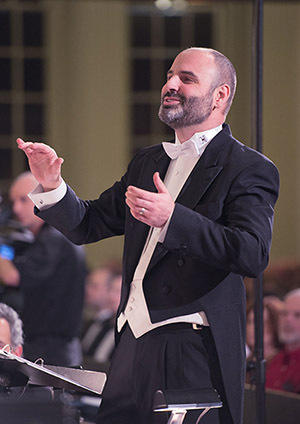 Since arriving at Syracuse University four years ago, Calvar has been active with several community choral groups, including serving as guest conductor of the Syracuse Vocal Ensemble and Syracuse Children’s Chorus. In June 2015, he was named artistic director of the Syracuse Chorale, an adult, non-audition community choir in operation since 1953. At least four Hendricks Chapel Choir alumni sing with Chorale. CMM honored John Warren, associate professor and director of choral activities, in 2012; the group honored Elisa Dekaney, chair of Setnor’s music education program, in 2006. Teaching college students and working with adults who participate in community choirs requires different philosophical approaches, he says. “At the university, the rigor I demand and how I enforce it is different than how I work with people who have worked all day and dealt with their families before coming to rehearsal,” he explains. Calvar has also been chosen to participate in the 2017 International Conductor Exchange Program of the American Choral Directors Association. He will spend 10 to 14 days this summer in Latin America. This semester, he started Sung Evening Prayer, a half-hour Sunday worship service at Hendricks Chapel. Hendricks Chapel Choir sings at the 7 p.m. event. Calvar calls it “an academic service of compline with elements of vespers,” referring to evening prayer. Sung Evening Prayer features Anne Laver, university organist, and special lighting provided by Hugh Jones, Julia Tucker and chapel staff. It’s followed by light refreshments and is open to the community. “I’ve tailored it to be as open and ecumenical as I can,” he says. Professional musicians, music majors, non-majors and amateurs reap benefits from singing, he says. “The benefit is the opportunity to use the abilities they have to come together and produce a product that’s satisfying on a level that transcends the personal,” he says.